St. Croix Falls, WI, September 6, 2017 – Brandtjen & Kluge (Kluge), the industry leader in digital print package converting solutions will demonstrate several NEW finishing equipment solutions at PRINT17. Advancements in die cutting, foil stamping, digital foil transfer, UV coating and folding and gluing will be on display at PRINT17 in Chicago, IL Booth #4015. Leveraging the benefits of the digital print workflow, the DIGITAL METAL® process allows digital transfer of foil onto paper and cardboard substrates. 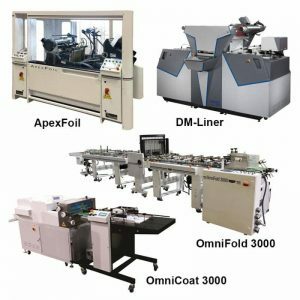 At the heart of the process is the DM-LINER®, a digital foiling device that precisely completes the foil transfer, optimizes foil usage and manages inventory intelligently. The DIGITAL METAL® process is highly effective in producing decorative effects for labels, brochures, invitations, magazines, packaging, photo cards, calendars, and more. The OmniCoat 3000 roller coater evenly coats a wide range of substrates. Other features include vacuum hold-down throughout, precision coating metering adjustments, digital variable-speed control and special high-density UV resistant applicator roller. Kluge offers a line of OmniCoat UV roller coaters for both production digital and wide format applications. The Kluge OmniFold 3000 Automatic Folding and Gluing System is a fully modular converting system designed to fulfill today’s need and grow with future demands of the commercial printer and packaging manufacturer. Built to maximize converting capabilities while minimizing set-up time, the OmniFold includes features that bring productivity and reliability to a new level of expectation. These advancements are met with the quality you expect from Brandtjen & Kluge. In BOOTH 4237 you will find the Kawahara TXR-1100 series blanking system. As the United States Dealer of Kawahara products; Kluge provides sales, logistics, technical support, spare parts and training for the complete line of blanking systems. Kluge invites everyone with blanking needs to stop and see how this equipment will meet your needs. Adding value since 1919, Brandtjen and Kluge is a fourth generation family owned manufacturer of specialty print finishing and converting equipment. For 98 years the brand name “Kluge” has represented innovation, technical leadership, productivity and rugged durability to companies worldwide. Headquartered in St. Croix Falls, Wisconsin, USA, Brandtjen and Kluge markets equipment through a direct sales force in the United States and Canada and has a well-established network of industry-qualified distributors to provide global coverage. For more information visit us at www.kluge.biz.